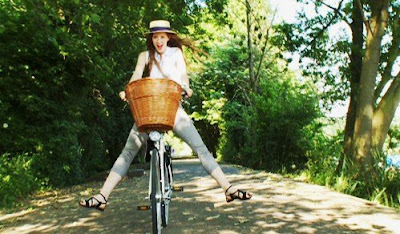 Topshop is is the current leader of the Cycle Chic peloton with this brand new advert featuring pure Copenhagenesque Cycle Chic. "This season green is the new black and bicycles are the only wheels to be rocking up in." Indeed. Nice one, Topshop. Our only minor regret is that it isn't a Danish bicycle, but we can live with that just this once. It's adverts like this that help generate not only pure Cycle Chic but also pure bike culture. Some people can get with the former, but everyone can get with the latter. Presenting the bicycle as a normal, easy and fun form of transport to an impressionable generation is brilliant. London cycle chic extraordinaire. In many ways, this video sums up everything we try to portray here at Copenhagen Cycle Chic and we're loving this little love-in we have with Topshop. Here are some stills from the video for your perusal. One thing is certain, Boris Johnson, the new Lord Mayor of London would love this video. As do we. Ride on. And have a giggle at the poor soul Jamie Caddick who wrote this letter to the editor in the Bristol Evening Post. Be sure to write a comment. Wow, I love this video too. What a nice way to celebrate the beginning of summer !!! Indeed, Manon! Tu as raison! That song is used in a U.S. commercial right now too! Though it is not a fabulous cycle chic Topshop commercial. Knowing the percentage of commercials of ours that are for cars, it's probably for that. Ugh. It would be wonderful to believe that Copenhagen Style Cycling is about to make a breakthrough in Bike-phobic Britain, but this article in the Bristol Evening Post suggests that we've got a very long way to go. The fact that the paper actually published the man's rant beggars belief. I'm all for free speech, but a little free thought helps. a stellar letter to the editor! i commented. so venomous that it is humourous. The Topshop campaign is great, I love it. More power to them! wow...that Bristol article has so much bile, it's hard not to be amazed and chuckle. Commented. Fun. Seeds of beauty being sprinkled all over...hope it works. The reason why I love checking in on your blog with my morning coffee is it takes me to another place - I become part of another, happier world far away, and for a brief moment in time during my day I completely escape. This beautiful ad is a perfect example - thanks so much for posting it! Out of curiosity, what is the bike? I think it is the [frightfully overrated] Pashley. J. Crew had a Jorg and Olif bike in their catalog (http://elseachelsea.typepad.com/frolic/2008/04/jcrew-jorg-and.html). They also used them in a store window in at least one of their locations (I think in NYC). "?Ill-informed and prejudiced buffoon; utterly mindless; fool; pillock; deluded, irrational; sad and bitter; silly man; bitter individual; bitter, bigoted; utter fool? It appears the standard of debate from cyclists matched their knowledge of the highway code. ?Bloody drivers trying to kill us every day!? Absolute tosh. I daily have to avoid cyclists weaving in and out of moving traffic, not just jumping lights but sailing through them on red and then having a go at any motorist who points out what they are doing. Cyclists should be licensed and insured and the Police should have the power of arrest and the power to crush the cycles of anyone found cycling on the pavement, through red lights, across zebra crossings when predstrians are using them etc etc etc. Well done on the Guardian article by the way. thanks, nigel! i'm well chuffed with that article.